We go over the Chips or Crisps debate at length on this website, and these Chips are a great advert for the UK name. They were 'Crisp' when biting through them. They were too thin in parts to provide a solid crunch - a crispy snap was more noticeable. That isn't a criticism, it just takes a handful to notice any sort of crunch. These were generally good sized Chips, with a fair amount of seasoning. Not all of it Barbecue orange. The Chips had a kind of greasy complexion, with some broken edges and incomplete Chips. The bouquet was barbecue. Not sweet, but robust and bold. It's not wine, but similarly, it's the taste that is most important - and it matched the smell. 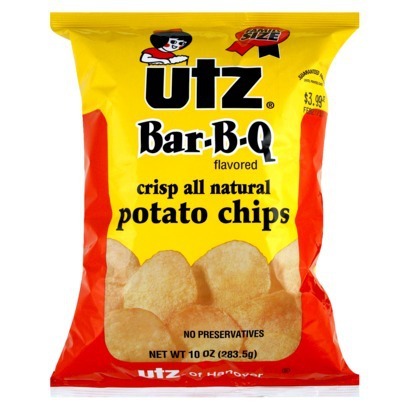 It wasn't sticky and sweet like many Barbecue Chips, but it did have a little kick. Just enough for a mass produced Chip manufacturer to get away with keeping everyone happy.